Karen Frattali, pwcs. bws, wsa. Whose painting style includes vivid, transparent color, no matter what the choice of subject matter. Landscapes, florals, still life or figuratives are all treated with the same painterly application. 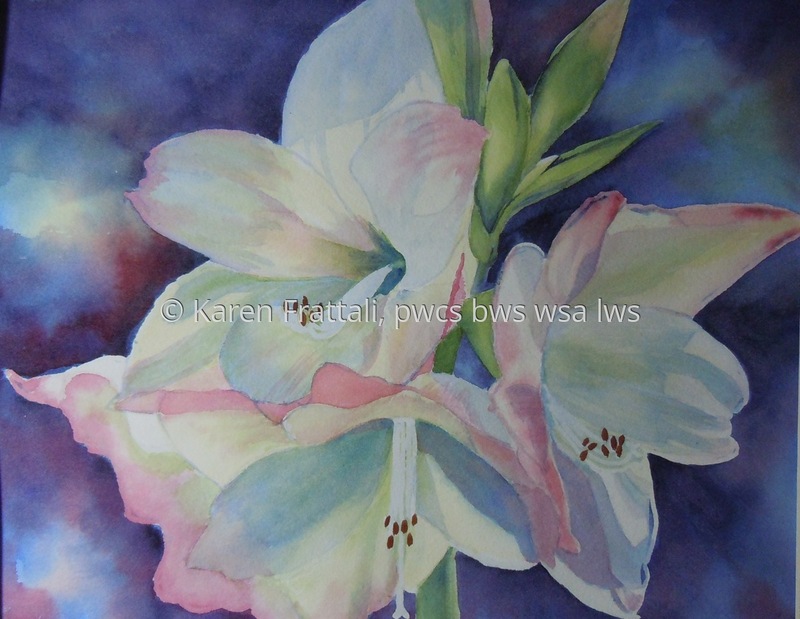 Signature member of Philadelphia Watercolor Society, Baltimore Watercolor Society and Watercolor Society of Alabama. Included in 2017 International of Georgia Watercolor Society, Watercolor Society of Alabama, 2017. Philadelphia Watercolor Society 117th Anniversary Juried Show. Included in the 77th National Juried Exhibition of the Watercolor Society of Alabama, 2018. Kentucky Watercolor Society, 2018. Philadelphia Watercolor Society, 2018. Part of the 2018 Public Arts display in downtown West Chester. Currently scheduling workshops for 2019.
transparent watercolor on paper. Matted in white and framed in gray wood.